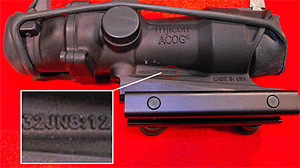 At the end of the model number on Trijicon's ACOG gun sight, you can read "JN8:12," a reference to the New Testament book of John, Chapter 8, Verse 12, which reads: "Then spake Jesus again unto them, saying, I am the light of the world: he that followeth me shall not walk in darkness, but shall have the light of life." The ACOG is widely used by the U.S. military. After ABC News reported that Trijicon scopes included coded Biblical messages, Trijicon said it would no longer include the inscriptions on scopes manufactured for the U.S. military, and that it would provide kits for the removal of the code on existing scopes. More than two months after an ABC News report that rifle scopes used by U.S. soldiers are inscribed with secret Biblical references, troops in Afghanistan and Iraq are still carrying the so-called Jesus rifles – and the U.S. military says it could take a year to remove the Bible codes from all its weapons. "Shame on them forever for their impossibly slow, plodding and utterly backwards plan for correction of this national and international disgrace," said Mikey Weinstein of the Military Religious Freedom Foundation (MRFF). Weinstein, whose advocacy group promotes the separation of church and state in the military, said the MRFF has received numerous messages from troops deployed in Afghanistan complaining that the Gospel inscriptions on Trijicon rifle scopes place them at added risk. A military spokesperson also told ABC News that Biblical references had been removed from just over a third of the military's Trijicon scopes, but that most of the scopes that had been altered were being used by troops in training situations and on bases, not by troops in war zones. Trijicon has sold an estimated 250,000 rifle scopes to the U.S. armed services, and the sights are used by U.S. troops in Iraq and Afghanistan and in the training of Iraqi and Afghan soldiers. The biblical references on Trijicon's Advance Combat Optical Guides, commonly known as ACOG sights, appear next to the model numbers in the same type font and size. References include citations from the New Testament books of Revelation, Matthew and John. One of the citations on the ACOG is "JN8:12", a reference to John 8:12, which reads, "Whoever follows me will never walk in darkness, but will have the light of life. "2COR4:6" is a reference to Second Corinthians 4:6, which reads: "For God, who commanded the light to shine out of the darkness, hath shined in our hearts, to give the light of the knowledge of the glory of God in the face of Jesus Christ." Under what is known as "General Order Number One" U.S. military rules specifically prohibit "proselytizing of any faith, religion, or practice." The rules were drawn up in order to prevent criticism that the U.S. was embarked on a religious "Crusade" in its wars in Iraq and Afghanistan. "It's wrong, it violates the Constitution, it violates a number of federal laws," said Weinstein, an attorney and former Air Force officer. "It allows the Mujahadeen, the Taliban, al Qaeda and the insurrectionists and jihadists to claim they're being shot by Jesus rifles." A worldwide furor erupted in January after the existence of the Bible codes was reported by ABC News. Countries around the world, including Australia, New Zealand, Canada, Israel and Great Britain, announced plans to remove the Bible codes from their Trijicon-supplied scopes. At the time, the U.S. military said it had been unaware of the markings until notified of them by ABC News. Gen. David Petraeus, commander of the U.S. Central Command, which oversees U.S. forces in Iraq and Afghanistan, said he was "very concerned" to learn of the Biblical markings on the Trijicon scopes. "Our mission is to protect the population we're serving and establish conditions for security, stability, and development, and we strive to do that while remaining sensitive to the cultural and religious norms of the populace we are supporting." Within a week of the initial ABC News report in January, the Department of Defense announced that Trijicon had agreed to stop printing the verses on new scopes intended for military use. The U.S. military also said it would modify the scopes already in use, and Trijicon agreed to provide 100 modification kits for the removal of the codes. But in March, Weinstein contacted ABC News to say that service members in Afghanistan were sending his group messages claiming that the military was dragging its feet on modifying the scopes. Weinstein said the service members complained that they felt uncomfortable with the unaltered scopes because many of the Afghan civilians and military forces being trained by the U.S. were aware of the controversy over the Bible markings. "In one case, a village elder refused to let one of our young soldiers into his house to look because he had a Jesus rifle," said Weinstein. "He went to his immediate superior [who] told him if you continue to complain, we'll take your rifle away and replace it with something less lethal." "It's not just embarrassing to have these "Jesus rifles" with us but it's also a serious security threat to all of us," reads one e-mail that Weinstein said MRFF received from a service member in Afghanistan . "When we walk into an Afghan village trying to determine whether it's 'friend or foe' regarding the Taliban etc. and they ask us right off the bat if we are using the 'Jesus rifles' it is a VERY BAD way to start out considering our combat mission." When first contacted by ABC News about Weinstein's allegations in March, the U.S. military told ABC News that it had received no complaints from service members about the Trijicon inscriptions. However, the military gave conflicting explanations on how it was modifying the scopes used by soldiers in Afghanistan and Iraq. A military spokesperson, Capt. Geraldine Carey of the Marine Corps, initially told ABC News that "deployed units will not begin the modification until they return to their home stations." Carey's statement echoed a March 15th article in the Army Times, in which Col. Doug Tamilio, a weapons administrator for the Army, said that ACOGs in war zones would not be modified until the soldiers carrying them had returned home to the U.S.
"We've got soldiers engaged in combat; I don't want to disrupt what the soldiers are doing over there," Tamilio told the Army Times. When ABC contacted Capt. Carey for clarification, however, she gave a different answer. She said that an unspecified number of the Trijicon modification kits had been sent to deployed locations – meaning to Afghanistan and Iraq -- for units to perform the scope modifications themselves. Carey also said the military is augmenting the Trijicon kits with common rotary tools and paint pens that can remove the inscriptions. Carey said the alterations to the scopes have to be performed by a technician "trained to perform preventive and corrective maintenance on the equipment," and "though the deployed troops are capable of performing the modification, conducting their combat operations is their first priority." Capt. Carey told ABC News that 35 percent of the scopes issued have already been altered. Most of these, however, were used by "training units at bases, posts, and stations" or "units in the deployment pipeline." She also confirmed something Tamilio had told the Army Times – that the military had allotted a full year to modify the scopes. The military 's "modification instruction" allows for one year for all the scopes to be altered, said Carey. That time frame provides "operating forces with the flexibility to perform the modification without interfering with scheduled training and operations." Weinstein said he recently heard from a father of a service member in Afghanistan who was not willing to wait. The father, said Weinstein, was "fuming mad that his son is being placed in harm's way by something that could be fixed in less than 30 seconds." According to Weinstein, the father said he went to a Home Depot and bought thin black duct tape for his son and his battalion so that they could stick the tape over the scripture passages themselves. "The father said he just sent the 101st fix kit over," said Weinstein.